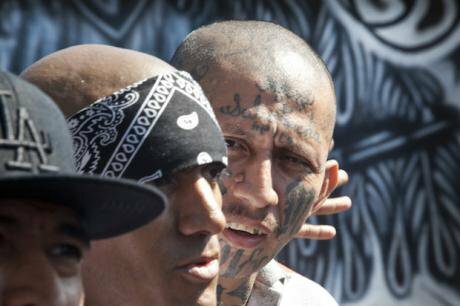 El Salvador is home to the most violent gangs in the world. Both the 18th Street gang (Barrio 18) and Mara Salvatrucha (MS-13) began in Los Angeles, California in the 1960s and 1980s, respectively. As the gangs evolved over time they created security issues for the United States government. The Illegal Immigrant Reform and Immigrant Responsibility Act (IIRIRA) of 1996 led to the deportation of many gang members back to their home countries in Central America. Not surprisingly, such policies contributed to the expansion of the gangs throughout the region. In 2012, the United States Department of Treasury labeled MS-13 as a transnational criminal organization. Both MS-13 and the 18th Street gangs partake in a variety of illicit activities. The most profitable activity of these gangs in El Salvador is extortion. People living and working within communities are required to pay rent (renta) to the gangs or they can face serious consequences. The increase in the prison population has led to severe overcrowding within the prison system. Gangs and failed government policies have contributed to the high levels of violence plaguing the country. In the early 2000s, the Francisco Flores government launched Mano Dura (iron fist) strategies to combat gangs and gang-related violence. These policies led to spikes in the number of gang members arrested. As a result, the prison population proliferated from a rate of 130 per 100,000 inhabitants in 2000 to 567 per 100,000 in 2016. The increase in the prison population has led to severe overcrowding within the prison system. Moreover, officials separated gangs within prisons. The separation of prisoners seems logical as prison officials do not want to place gang members from rival organizations in the same cells. However, scholars, such as José Miguel Cruz, note that such strategies have had unintended consequences. Prisons served as “schools of crime” as gang members from different cliques housed within the same prison complex began to network and organize. In sum, prisons became an integral part of gang life, and gang leaders “call the shots” while incarcerated. Ex-gang members face high levels of discrimination by society. Prisons throughout the country requires significant reforms. The prison system is plagued by high levels of overcrowding at around 348 percent. The high levels of overcrowding lead to serious concerns about human rights abuses due to the horrific living conditions of the prisoners. Overcrowding can also increase tension among inmates and foment high levels of violence. In addition, Salvadoran prisons do not effectively rehabilitate former gang members. Former prisoners face major challenges as they attempt to find employment after leaving prison. Ex-gang members face high levels of discrimination by society. Not only do former gang members have enemies within their former gang, but they also have to be careful as rival gang members may seek to harm them. The current government of Salvador Sánchez Cerén has continued a tough on crime approach to gangs in the country. In 2015, the Supreme Court labeled both the 18th Street gang and MS-13 as terrorists. These controversial counter-gang strategies have increased levels of violence between the police and gang members. Such policies have also contributed to prison overcrowding. The government cannot afford to continue incarcerating so many young Salvadorans. New strategies must be implemented to reduce the number of people in the prison system and attempt to prevent youth from becoming involved in criminal activities and the gang life. The Salvadoran government is at a critical juncture. Counter-gang strategies are often popular among the public because people want to feel safe and increase security levels. Gang members partake in crime and other delinquent behavior, which help increase the levels of insecurity in El Salvador. Harsh anti-gang strategies can help the current government demonstrate to society that it is tough on crime and serious about combating gangs and gang-related violence. However, history shows that such policies only lead to more violence and do not resolve many of the underlying issues. Studies, such as the one conducted by José Miguel Cruz and his colleagues at Florida International University, demonstrate that gang members in El Salvador are from marginalized communities and are highly uneducated. It is important to address the underlying causes of why people join gangs. Solving these issues is not easy as a magic solution does not exist. Yet the lesson of past policies is that mano dura strategies only lead to more violence and are not effective. Finally, Central American governments that are plagued by high levels of corruption, impunity, and inequality are ripe places for gangs and other organized crime groups to operate. As the elections in El Salvador approach, it remains to be seen who will win and what security strategies will be implemented. These outcomes could determine whether the same hardline strategies designed to combat gangs and gang-related activity continue unabated. The next president will have to address many of the underlying problems in the country, including the high levels of violence as well as corruption and lack of transparency. Institutions throughout the country, including the executive, have been tainted by corruption scandals. Former President Antonio “Tony” Saca, for instance, is currently incarcerated in La Esperanza, Mariona for stealing hundreds of millions of dollars from the country. In addition, former President Mauricio Funes fled to Nicaragua after corruption allegations. Other institutions, such as the police and the military, allegedly have been involved in death squads. In sum, the future of El Salvador looks bleak unless the institutions within the country can be strengthened through serious reforms.